The inaugural SVG US Sports OTT Forum in New York City brought in-depth conversation and networking to the live sports streaming industry. More than 200 attendees discussed such topics as OTT product offerings, direct-to-consumer business strategies, latency, security, and much more. The event kicked off with a broad look at the current state of the financial and technological challenges and opportunities that face the live–sports-streaming space in the US by streaming-media expert and widely respected industry consultant Dan Rayburn. 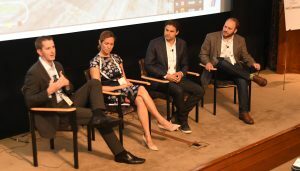 From there, a panel of marquee executives shared their plans, hopes, and dreams for the present and future of sports media in an OTT environment. Participating in the session were Eric Black, CTO, NBC Sports Digital and Playmaker Media; Sung Ho Choi, co-founder, fuboTV; Skip Desjardin, head of sports and local content, YouTube TV; Zach Leonsis, SVP, strategic initiatives, Monumental Sports and Entertainment; and Chris Wagner, EVP, NeuLion. Attendees were also treated to a look at some of innovative and mind-opening ideas from some of the nation’s most successful sports leagues. Representatives from NASCAR, the NBA and WWE discussed current offerings, plans, and marketplace challenges. Brian Herbst, VP, global media strategy and distribution, NASCAR; Christine Pantoya, SVP, direct to consumer and mobile strategy, NBA; and Jared Smith, SVP, digital products, WWE, shared ideas for new successes in the mobile and streaming worlds both domestic and international. The event also featured a series of in-depth case studies offering updates on industry-altering services and platforms designed to push the content envelope in new ways. Hania Poole, GM, Bleacher Report (B/R) Live, and SVP, NCAA Digital, offered a look at the strategy and build-out process for the newest OTT sports service, B/R Live. David Bailey, senior digital research manager, Formula 1, presented data findings that helped shape the creation of one of the newest OTT products: F1 TV. Melissa Lawton, an expert in live–sports-production strategy for Facebook, updated attendees on the latest in best practices on live-streaming events to the social-media platform. Also, Eric Black, CTO, NBC Sports Digital and Playmaker Media, and Darryl Jefferson, VP, post operations and digital workflow, NBC Sports and Olympics, gave an inside look at how they work digital and streaming offerings into the day-to-day life of a traditional broadcast giant. Technology and the companies creating the tools that are moving sports-video viewing into its next generation also got their chances on centre stage. Latency and quality of service of live sports streams were addressed by a panel featuring Aditya Ganjam, chief product officer, Conviva; Jason Hofmann, VP, architecture, Limelight Networks; and Kiran Patel, solutions marketing manager, AWS Elemental. Naturally, security and combating piracy were also dissected in a talk with Prenil Kottayankandy, principal solutions engineer, Akamai; Mark Thames, Americas security partner leader, Juniper Networks; Harrie Tholen, VP, sales anti-piracy/GM, NexGuard, Nagra; and Jason Thibeault, executive director, Streaming Video Alliance. Attendees were also in-depth technology dives by Ben Bloom, director, professional services, media and entertainment, Akamai; Karan Singh, director, product management, Sony New Media Solutions; and NeuLion’s Wagner. The SVG Sports OTT Forum was made possible through the support of this year’s event sponsors: Title Sponsor AWS Elemental; Diamond Sponsors Dolby and Limelight Networks; and Event Sponsors Akamai, Aspera (an IBM Company), Juniper Networks, NeuLion, Sony, and Verizon Digital Media Services. The SVG Sports OTT Forum was a closed-door event, and there will be no additional reports or coverage of the forum’s programming. If you are interested in learning more about the event or the wider efforts of SVG US Digital, please email SVG US Director of Digital Brandon Costa at [email protected].